Always set your time zone before setting your dates and times. If you set your times first and then adjust your time zone, Electionbuddy adjusts your times according to the time zone you've chosen, which may result in you having start and end times that you don't actually want! Pick the timezone relevant to your election. Either type out, or select from the list (the buttons on the end of the input area - the calendar and clock), your start date and time for your election. 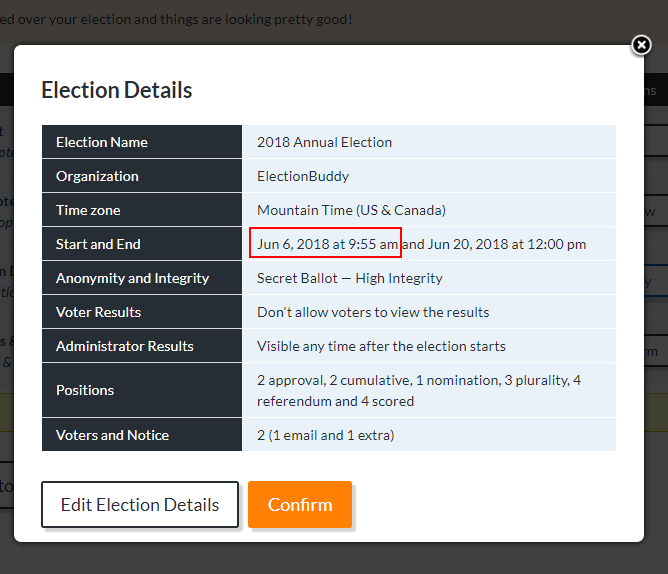 Either type out, or select from the list (the buttons on the end of the input area - the calendar and clock), your end date and time for your election. The election start and end date/time input fields are predictive - as you type, they will suggest input for you. To choose the suggested input, click on it, or hit "Enter". The election start and end date/time input fields are also "clever". For example, try typing "now" into your election's start time! Have you checked your election's end date/time? You cannot set a start date/time that is after your election's end date/time. Try changing your end date/time before you adjust your start date/time! You can choose a time that is not on the quarter hour, although it looks like you can't. 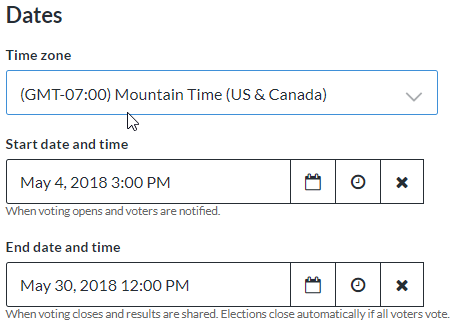 For example, if you are trying to set your election start time to 2:55 PM, you cannot select this option from the drop-down list that appears when you click the clock-labeled button, and when you type it in, it is going to appear to change to 3:00 PM (see the image above). If you've typed in 9:55 AM, and it changes to 10:00 AM, proceed through the rest of your election setup until you hit "Review". Take a look at your election's details: The intended time was saved as your election start time! It's a little confusing - we know. But, this occurs for some somewhat complex technical reasons, related to the fact that the list is intervaled on the quarter hour (it is not a bug - there are technical limitations involved).